Among the most popular designer dog breeds we find the Schnoodle, a cross breed between the Poodle and the Schnauzer breeds. Some of the most appreciated characteristics of both breeds are to be found in the Schoodle, which is a very friendly dog, getting along just fine with all people, no matter the age. The history of this cross breed goes back in time, finding its beginnings with over 40 years ago. The Schnoodle proved to be an excellent family dog, very active and with a strong personality. They have the advantages of a rather long life expectancy, while being prone to quite few health issues. It has been noted that the Schnoodles are hypoallergenic so they are very suitable for families with pet allergies. Due to their gentle nature, these dogs get along quite well with both children of all ages and other pets, be it dogs or various smaller pets. Intelligence is on the list of qualities, making the Schnoodle extremely trainable, also allowing them to be used as therapy dogs. With regards to looks, there are multiple combinations of coat type and colors, but the Schnauzer genes tend to be more influent. Wavy, tightly curled or straight, the coats are in most cases soft and require a low level of grooming, especially that shedding is also at a low level. The colors of the coats can include black, brown, tan, white, gray, apricot, silver or combinations of black with differently colored markings, but of all these black, silver and gray are the most common. The Schnoodle body is usually square in form, having a slightly arched back. The tail kept straight up betrays the fact that the dog is happy and active. The opposite moods are suggested by a tail tucked down. The head is medium sized, bearing a muzzle that is a bit wider than the Poodle’s, but still a bit narrower than the head base. Oval or round eyes are dark brown colored and the ears are also medium in size and are permanently used during training or playtime as a means of the dogs expressing themselves. The overall look of a Schnoodle is that of an alert animal. There are three different configurations in which the Schnoodle can come, varying in size and weight. Thus, a Toy Schoodle will only go up to 31 centimeters and 7 kilos, the Standard Schnoodle can usually reach a maximum height of 66 centimeters and a weight of 35 kilos and the Miniature Schnoodle will weigh no more than 10 kilos and measure 40 centimeters in height. 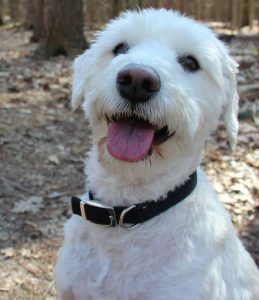 Schnoodles are known to have mild, gentle temperaments, manifesting themselves with affection around their family, to which they are also very loyal. With strangers, they may be a bit reserved and suspicious and will usually bark, heritage from the watchdog gene of the Schnauzer. Active dogs, the Schnoodles will enjoy a lot of exercising and playing to keep their intelligence and curiousness alert. However, they will also enjoy lying down next to their masters’ feet or on their lap. Although the Schnoodles enjoy playing and exercising, the need for these activities is in fact low, so just wandering around the house and in the backyard, accompanying the family members in their own activities should do the trick. They adapt to living indoors, so they do well in apartments. The life expectancy of a Schnoodle can surpass fifteen years, which is a rather long term for a dog. This is also backed up by a smaller range of health issues, of which the most common are consisted of skin conditions. These can include a high sensitivity of the skin (probably the most common issue), allergies manifested through itching symptoms (most often they have the food as a cause or some other environmental factors) and dry or oily seborrhea (the first is more spread and causes scaling skin while the second determines the skin to be greasy and having a really bad odor). In the case of the Schnoodle, the mixing of genes led to a breed that is less exposed to health issues than the parents. There are cases though in which the Schnoodles are exposed to health conditions both parents are commonly prone to. Among these, there are the Schnauzer canine hyperlipidemia (which manifests through higher levels of lipids, triglycerides, fats and cholesterol in the blood) and the comedo syndrome from the Schnauzer side (signs for the latter include blackheads and papules on the back). Besides these conditions, there is a risk for pattelar luxation, which means that due to slack ligaments of the knee, the kneecaps are likely to slip out of their places. The Schnoodles make excellent family dogs, mainly because of their friendly natures, strong personalities and their attachment to their families. Despite their gentle way of being, they can turn aggressive especially towards strangers, when and if they feel their families need to be protected. It is proper training that can diminish the intensity of these watchdog instincts and also can correct or improve certain behavioral aspects such as exaggerated barking. While miniature Schnoodles are the most suitable for families, the toy and the standard ones would prefer families with older children. All the qualities of the Schnoodles help them integrate easily in families and adapt to almost any type of home and life style. Their loyalty to their family and affectionate nature reduce the potential unwanted impact of their watchdog instincts manifestations.